How to create HTC Hero videos from TiVo recordings? Home » How to create HTC Hero videos from TiVo recordings? Transfer times vary, but may be as long as the show's duration to complete the transfer, so you have to be patient when copying TiVo to PC. You may download and install the TiVo to HTC Hero Converter and try it out. The trial gives you full access of the features, but creates video with a Pavtube logo on the screen. Step 1. Input Media Access Key. Launch TiVo to HTC Hero Converter, Click on the “Option” button, switch to TiVo tab, and enter your Media Access Key. Click “OK” to confirm. Step 2. Run TiVo to HTC Hero Converter and import source TiVo shows. Click “Add” to load recorded TV shows, or you could just drag and drop the *.tivo files to the TiVo to HTC Hero converter. Step 3. Set output format to fit for HTC Hero. 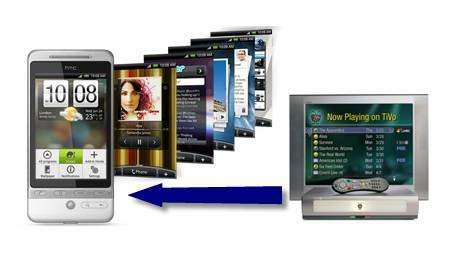 Pavtube Video Converter is recommended as a best tool to help you complete the TiVo to HTC Hero conversion, as it features optimized format for HTC Hero. To convert TiVo to HTC Hero, you need to select the proper format specialized for HTC Hero. 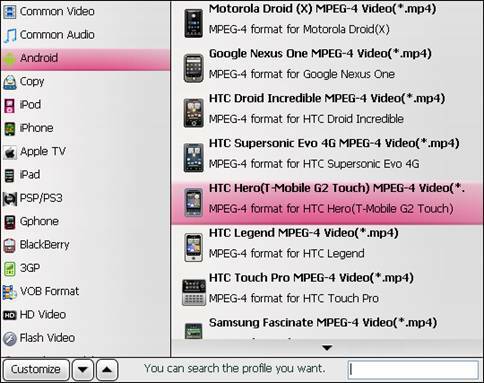 Just click the drop down list of “Format”, and then tap on “Android” to choose “HTC Supersonic Hero MPEG-4 Video (*.mp4)” as output format. This format is specialized for both HTC Hero, which guarantee fluent and perfect video playback on the HTC Droid. You can click “Settings” button to set advanced settings as well. Video and audio parameters including codec name, aspect ratio, bit rate, frame rate, sample rate, and audio channel can be adjusted in your own way. If you feel like improving the visual quality, just set bit rate up and it will looks better on screen. By default the file size is “480*320” and. But notice that the file size grows with the bit rate. And do not forget to click “OK” button to confirm your settings before you start converting TiVo to HTC Hero videos. Now click "Convert" button and wait. The popup window will present you the task information such as conversion progress, conversion state, elapsed and estimated conversion time, and generated and estimated conversion file size. After conversion you could click the "Open" button next to output box to find the converted files. You may check "Shut down computer after conversion" and leave it be if it takes long to convert TiVo to HTC Hero videos. Part 3: Transfer converted TV recordings to HTC Hero. To transfer files from your computer to your phone’s storage card, you need to set the phone’s storage card as a USB drive. Connect the phone to the computer using the USB cable, and then choose Disk drive from the on-screen menu that appears. The storage card is now mounted as a USB drive. Drag and drop the desired files to your PC to back them up. Then you can play them freely on HTC Hero.